Whether you celebrate Christmas or not, you can probably relate to this poem Melanie Lefebvre wrote for Lee Baer’s OCD and Families blog. Take care of yourself during this typically busy time of year! I don’t know what’s harder to believe, that it’s Tuesday already or that it’s December already. Here in Minnesota we’re finally getting our first inches of snow. Today’s guest, Wendy Mueller, is always eager to remind me that where she lives — Southern California — she never has to deal with snow or cold temperatures. Let’s get Wendy’s take on it all. You run a huge online support group called the OCD-Support List. How did you become involved with this great resource? Twenty-eight years ago, I developed severe OCD upon the birth of my first child. For the first year and a half, I didn’t even know what was wrong with me. I hid my OCD symptoms from everyone around me, because I thought I was going crazy and I didn’t want to be put in a psychiatric hospital. 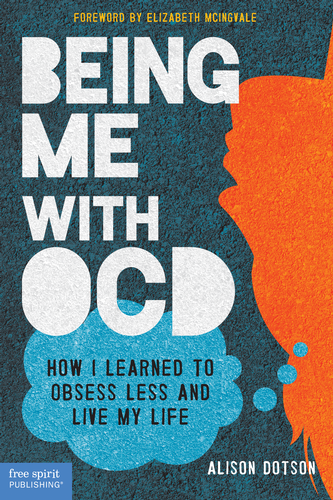 Once I found out that I had OCD (after reading an article about OCD in Newsweek magazine in early 1989), I immediately started to seek out some sort of support system so that I could talk to other people who had OCD. When I got my first computer in 1990, I started looking around the various health “bulletin boards” on the Prodigy computer network, but I was unable to find any support groups related to OCD. So I decided to start one on my own. I created a new topic for OCD and posted a message asking if there were other people suffering from OCD, and — little by little — my small online OCD group began to grow. I moderated that Prodigy group for about seven years (we eventually had about 60 members of the group), but I also joined another larger online OCD support group that was being moderated by Chris Vertullo, an OCD advocate. Her group had hundreds of members, and it was a very active support group that also included regular contributions from several OCD experts, including Dr. James Claiborn and Dr. Michael Jenike. When Chris decided to “retire” from leading the group in 2001, I took over leadership of the group with a few hundred members. Over the years, the group has snowballed into a huge group that now has more than 5,200 members from all over the world. Dr. Claiborn still contributes daily to the group, and I keep a close eye on the messages being posted so that we always stick to the topic of OCD. So, the shorter answer to your question is: I started up an online support group back in 1991 because I personally wanted to communicate with other people with OCD. For four years, I was part of the online group as a sufferer. However, I recovered almost completely in 1995 (thanks to taking medication and learning exposure and response prevention [ERP]), and ever since then, I have been able to encourage and give hope to others who are still struggling by telling people my own story of recovery from severe OCD and depression. Obviously you find value in online support groups. What advantages are there to meeting online vs. meeting in person? There are some great advantages to meeting in an online group, as opposed to an in-person group, but the first thing you need to do is make sure that you find an online group that is well-moderated by someone who regularly reviews the posted messages and makes sure that people stick to the topic of OCD. It’s also important to have a closely moderated group so that the moderator can correct any misinformation that is posted and also so that the moderator can intervene in the case of any angry or hurtful comments that might be posted. It’s important to have the group moderated by someone who is there regularly, keeping an eye on things on a daily basis. It’s also good to find a group that has contributions from OCD expert doctors/therapists, so that members are getting the best information and guidance possible regarding the proper treatment for OCD. An online group is a terrific choice for people who have no local access to OCD treatment in their area or who cannot afford OCD treatment. Also, many people with OCD find it extremely hard to talk about their OCD with others — even with a therapist — but one can remain completely anonymous in an online group so that no one ever knows your true identity. You can even join an online group just to read the messages posted by other members; you can remain quiet and just “lurk,” without ever having to say a word. It can be extremely helpful to read the discussions going on between other members of the online group as well as the contributions from the OCD expert therapists in the group. With an online group, there are no restrictions to the time of day that you can seek support. There are people posting and answering messages at all hours of the day — even in the wee hours of the night — so you can almost always get an understanding and helpful response from someone, no matter what time of day you post a message to the group. You developed postpartum OCD after your first daughter was born, and like so many other mothers you were afraid to tell anyone what you were going through — you didn’t want your child taken away, or to be involuntarily committed to a psychiatric ward. Of course, those fears were unfounded, but you didn’t know that at the time. When did you finally realize you had OCD, and how did you make the connection? I finally realized I had OCD when I came upon an article in Newsweek magazine in which Patricia Perkins (one of the original founders of the International OCD Foundation) was interviewed about her OCD and about the work of IOCDF. As soon as I started reading that article, I knew — without a doubt — that’s what I had been struggling with for the last 18 months since my daughter was born. The article described exactly the type of “crazy” things I had been doing all that time — checking door locks and stove knobs, compulsively lining things up neatly and symmetrically, counting to a “magic” number in my head whenever I did things, compulsively repeating actions over and over until it “felt right,” and worrying excessively about almost everything I did all day long. As soon as I read that article, I told my psychiatrist (who was treating me for depression) that I knew I had OCD, and that was the beginning of my road to recovery. The first thing I did was join IOCDF so that I could receive their regular newsletters, and I started attending their annual conferences, starting with the very first one in October 1993 in Minneapolis. At the time I finally realized that I had OCD, I was severely depressed and extremely disabled by severe OCD, depression, and anxiety. I never slept well, and I cried throughout the days, feeling hopeless and helpless about my life. At that time (1989), I believe that Prozac was the only medication that had come onto the market that was being prescribed for OCD, so I was very willing to give it a try (which I did, but was unsuccessful due to side effects I couldn’t tolerate). I also started reading any books about OCD I could get my hands on, like The Boy Who Couldn’t Stop Washing by Judith Rapoport, Getting Control: Overcoming Your Obsessions and Compulsions by Lee Baer, Stop Obsessing! by Edna Foa and Reid Wilson, and When Once Is Not Enough by Gail Steketee and Kerrin White. The more I read about OCD, the more hopeful I became that I would eventually get better. Unfortunately, I had a difficult time finding a medication for OCD that didn’t cause initial side effects that I found intolerable. Prozac caused me to be very agitated and anxious, so I had to give up on taking it after a short while. In subsequent years, at different times I tried Anafranil, Zoloft, and Paxil, but those three medications caused me to be very disoriented and confused, so I was forced to give those up also after a short period of time. Just when I thought I was never going to be able to tolerate any of the OCD medications, a friend with OCD told me to try Prozac in liquid form so that I could start taking it at a very tiny initial dose and very slowly increase the dose over a long period of time, which would enable me to gradually get used to the medication and hopefully avoid any bad side effects. It worked beautifully! It took me about four months to go from 1 mg/day to 60 mg/day Prozac, but once I got up to 60 mg/day and stayed at that dose for about five to six weeks, I really began to notice my OCD fading away. It felt like breaking out of prison! Once I got much better on the medication, I was then able to really dive into learning how to do ERP for my OCD. Prior to taking the Prozac, I had not been successful with ERP, because the OCD was too strong for me to fight through the anxiety. Once the medication successfully kicked in, then I started to make progress with ERP. The combination of medication and learning ERP brought me to almost complete recovery from my six years of severe OCD and depression. Both of your daughters have OCD as well. How did your own experience with the disorder help you recognize the symptoms and get them through it? Also, what would you tell someone who already knows they have OCD and worries they’ll pass it along to their children? A lot of people with OCD worry that they shouldn’t have children, for fear that they will pass their OCD on to their children. This is certainly a possibility. But if you have OCD yourself and know the proper treatments for it, then you are the best possible person to recognize OCD in your child and to guide your child to the correct treatments. Because I knew what it was like to suffer from OCD (and recover from OCD), I knew what my two daughters needed when their OCD started to flare up when they were kids. I was able to recognize their OCD symptoms when they first appeared and promptly seek out the proper therapy and medication for them. They are now both in their 20s and are doing well. You’re doing well now. How do you keep on top of your symptoms? How long has it been since you really struggled with OCD? I was very fortunate that both medication (Prozac) and ERP worked so well for me. Because Prozac made such a huge difference in my recovery, I have continued to take the 60 mg/day Prozac for more than 20 years now. I feel like the medication saved my life. I’m still so thankful for my recovery that I have never considered stopping the Prozac in all those years. (I’m fortunate that I don’t have any adverse side effects to the medication.) Because the Prozac continues to help and because I know how to use ERP whenever I get an OCD “urge,” I really have not struggled with OCD for about 20 years. Once you learn how to use ERP correctly and effectively, you have the tools necessary to fight any OCD issues that come your way. Even if your OCD appears in a form that it has never taken before, once you know how ERP works and how to apply it, you can conquer any type of OCD that comes your way. Learning how to use ERP is hard work, but once you get the hang of it, it really works. I absolutely know that I’m much stronger than my OCD now, so I no longer have a fear of it tormenting me like it did in years past. How can someone with OCD join your support group? Anyone can join my online “OCD-Support” group by sending a blank email to OCD-support-subscribe@yahoogroups.com. My group is not only for individuals with OCD but also any family members and friends of people with OCD, as well as treating professionals. In addition to my large general OCD support group, there are many other well-moderated groups on YahooGroups for more specific OCD issues or groups of people, such as groups for Teens with OCD, Parents of Kids with OCD, Pure-Obsessional OCD, Scrupulosity, Compulsive Skinpicking, Parents of Teens and Young Adults with OCD, and many more. Never lose hope that you can conquer your OCD. The evidence-based treatments (CBT/ERP and the OCD medications) really do work. Believe in them. Work hard at learning how to do ERP. Your persistence and hard work will pay off in the end. But never, ever lose hope. You really can get control of your OCD and return to living your life the way you want to live it.